This application protocol describes a reliable workflow for the isolation and cultivation of CD4+ T cells directly from mouse spleen that is fully compatible with downstream applications. Mouse spleens are dissociated into a single-cell suspension using the gentleMACS® Dissociator. Then, CD4+ T cells are magnetically enriched with the CD4+ T cell Isolation Kit, mouse and subsequently activated and expanded with CD3 and CD28 antibody loaded MACSiBeads™ (T cell Activation and Expansion Kit, mouse). Proliferation, phenotype, and expression of activation markers are assessed by flow cytometry at different time points. On day 7 after activation, cells are examined for cytokine expression. Therefore, cells are restimulated with ionomycin and PMA, treated with Brefeldin A and intracellularly stained for cytokines. Additionally, cell culture supernatants are collected 24 h after restimulation and analyzed for cytokines using the MACSPlex Cytokine 10 Kit, mouse. ▲ Note: The MACSQuant VYB cannot be used. ▲ Note: It has to be ensured that the sample material is located in the area of the rotor/stator. Resuspend sample in buffer and apply the cell suspension to a Pre-Separation Filter, 30 μm, placed on a 15 mL tube (1–2 mouse spleens per C Tube) or to an appropriate cell strainer placed on a 50 mL tube (3–6 mouse spleens per C Tube). Wash Pre-Separation Filter with 5 mL of buffer. Resuspend cells in buffer to the required volume for further applications. For example, resuspend cells in 10 mL buffer for magnetic labeling. Resuspend cell pellet in 400 µL of buffer per 1×10⁸ total cells. Add 200 µL of buffer per 1×10⁸ total cells. (Optional) For highest recovery wash cells by adding 1–2 mL of buffer per 1×10⁸ total cells and centrifuge at 300×g for 10 minutes. Aspirate supernatant completely. Resuspend up to 1×10⁸ cells in 500 µL of Buffer. Prepare column by rinsing with 3 mL of buffer. Wash column with 3 mL of buffer. Collect unlabeled cells that pass through, representing the enriched naïve CD4+ T cells, and combine with the effluent from step 3. (Optional) Remove column from the separator and place it on a suitable collection tube. Pipette 5 mL of buffer onto the column. Immediately flush out the magnetically labeled non-naïve CD4+ T cells by firmly pushing the plunger into the column. TexMACS™ medium supplemented with 2-Mercaptoethanol (final concentration 0.01 mM) and 100× penicillin/streptomycin stock solution (final concentration 1% ) and 50 U/mL Mouse IL-2. Make sure to freshly add IL-2 to the T cell medium for cell expansion. For some experimental procedures, T cell medium without IL-2 has to be used (see "Restimulation of polarized T cells and brefeldin A treatment"). Optionally, up to 10% FBS can be added to the TexMACS medium to further boost expansion rates. Instead of TexMACS medium, RPMI supplemented with FBS (10% final concentration), 100× L-glutamine stock solution (1% final concentration), 2-Mercaptoethanol (0.01 mM final concentration), 100× penicillin/streptomycin stock solution (1% final concentration) and 50 U/mL Mouse IL-2 can be used for T cell cultivation and expansion. Cell proliferation is typically analyzed on days 1, 3 and 7. However, please feel free to modify checkpoints according to your experimental needs. Make sure to have at least one additional well per condition (e.g., stimulated and unstimulated control) for analysis purposes left. To analyze cell proliferation use, e.g., CellTrace™ Violet Cell Proliferation Kit (Thermofisher, #C34557). To assess expansion rates, please also determine cell numbers on each respective day by e.g., counting cells with a Neubauer Chamber or by using the counting function of the MACSQuant® Analyzer 10. The here recommended procedure for using the CellTrace Violet Cell Proliferation Kit differs from the manufacturer’s instructions. If desired, follow manufacturer’s instructions instead. Freshly prepare the 5 mM CellTrace Violet stock solution by adding 20 µl DMSO (Component B, provided with the CellTrace Violet Cell Proliferation Kit) to 1 vial of CellTrace Violet (Component A). Mix well. For each sample resuspend up to 2×10⁶ in 1 mL PBS and transfer to a suitable tube (e.g., 15 mL tube). Add 1 µl of the 5 mM CellTrace Violet stock solution to a final concentration of 5 µM. Mix well and incubate for 5 minutes at 37 °C. Add 1 mL of FBS, mix well. Resuspend cells in an appropriate amount of supplemented T cell medium (e.g., 2×10⁶ cells in 2 mL/well of a 24-well plate). Treat cells as other samples and proceed with cell stimulation, expansion, incubation, or analysis. At measuring time points, resuspend cells directly in the well and take an aliquot (e.g., 100 µL when cultivating in a 24-well plate). Add an appropriate amount of buffer to dilute cells (e.g., 500 µL of buffer to an aliquot of 100 µL) and analyze proliferation by flow cytometry in an instrument with a 405 nm excitation source (e.g., MACSQuant Analyzer 10). Make fresh T cell medium with TexMACS™ medium supplemented with 2-Mercaptoethanol (final concentration 0.01 mM) and 100× penicillin/streptomycin stock solution (final concentration 1% ) and 50 U/mL Mouse IL-2 (see "Staining for analysis of cell proliferation" for more details). ▲ Note: Make sure to freshly add IL-2 to the T cell medium for cell expansion. Recommended reconstitution: 0.1mg/mL by reconstituting a 100 µg vial of mouse IL-2, research grade with 1 mL deionized sterile-filtered water. This results in a final activity of 500 U/µl. It is recommended to reconstitute lyophilized mouse IL-2, research grade with deionized sterile-filtered water to a final concentration of 0.1–1.0 mg/mL in a minimal volume of 100 µL. Further dilutions should be prepared with 0.1% bovine serum albumin (BSA) or human serum albumin (HSA) in phosphate-buffered saline. The ED50 is ≤0.2 ng/mL, corresponding to an activity of ≥5×106 U/mg. To make a cell culture medium supplemented with e.g., 50 U/mL, add 1 µL reconstituted mouse IL-2, research grade to 10 mL cell culture medium. Prepared aliquots of mouse IL-2 can be stored at –70 °C for up to 6 months until further use. Resuspend Anti-Biotin MACSiBead Particles thoroughly by vortexing before use to obtain a homogeneous suspension. Remove 500 μL Anti-Biotin MACSiBead Particles (1×10⁸ Anti-Biotin MACSiBead™ Particles) and add to antibody mix. Resuspend loaded Anti-Biotin MACSiBead Particles thoroughly and transfer 40 μL (4×10⁶ loaded Anti-Biotin MACSiBead Particles) per 2×10⁶ cells to a suitable tube. ▲Note: If unloaded MACSiBead Particles are to be used for negative control experiments, replace loaded Anti-Biotin MACSiBead Particles with 40 μL (4×10⁶ beads) of unloaded Anti-Biotin MACSiBead Particles per 2×10⁶ cells. Add 1 mL of T cell medium to the loaded Anti-Biotin MACSiBead Particles and centrifuge at 300×g for 5 minutes. Aspirate supernatant and resuspend loaded Anti-Biotin MACSiBead Particles in 1 mL of fresh T cell medium supplemented with IL-2. 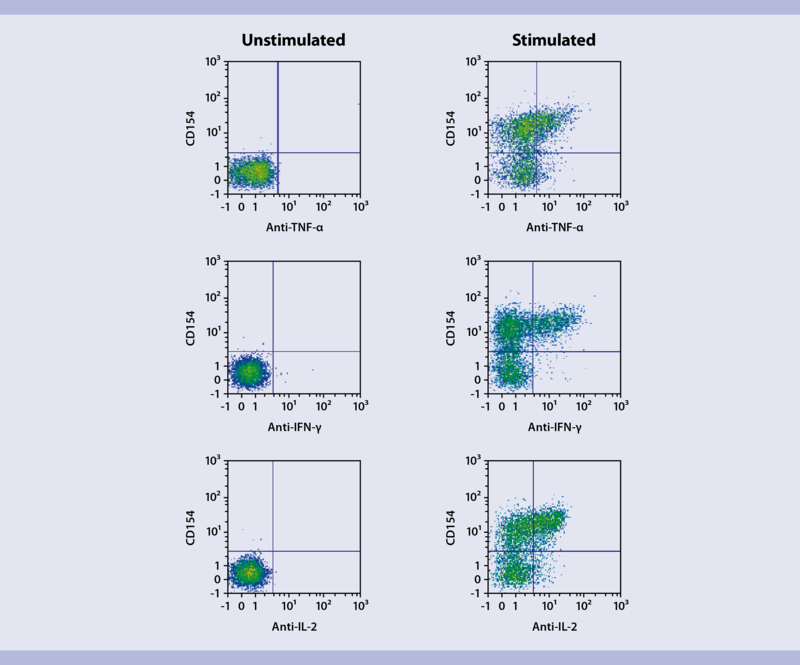 Resuspend cells at a density of 2×10⁶ cells per mL of T cell medium supplemented with IL-2. Add the cell suspension and the prepared Anti-Biotin MACSiBead Particles from step 3 to a suitable cell culture vessel at a density of 1×10⁶ cells per mL per cm2 (e.g., 2×10⁶ cells in 2 mL/well of a 24-well plate). Incubate at 37 °C and 5–10% CO₂ for up to 2 days. ▲Note: Inspect cultures daily, and add fresh T cell medium if required. Split the cell culture every two days 1:4 or 1:2, depending on the proliferation of cells, and add fresh T cell medium supplemented with IL-2. (Keep cells at a density of 1×10⁶ cells per mL per cm2; e.g., 2×10⁶ cells in 2 mL/well of a 24-well plate). ▲Note: Inspect the culture daily. Depending on the expansion rate, it might be necessary to split culture more frequently than every 2 days. After 6–8 days of activation, T cells are in a resting state and further expansion of T cells requires a restimulation. Store mastermix in the dark in the refrigerator (2−8 °C) until use. Do not store for extended periods. Cells are typically phenotyped on days 0 and 7. However, please feel free to modify checkpoints according to your experimental needs. For each sample, resuspend up to 1×106 nucleated cells in 50 µl phenotyping master mix (see phenotyping antibody panel in "Things to prepare in advance"). ▲Note: Higher temperatures and/or longer incubation times may lead to non-specific cell labeling. Working on ice requires increased incubation times. Wash cells by adding 1−2 mL of buffer and centrifuge at 300×g for 10 minutes. Aspirate supernatant completely. Resuspend cell pellet in a suitable amount of buffer (e.g., 500 µl) for analysis by flow cytometry. ▲Note: Add propidium iodide according to the manufacturer’s instructions before flow cytometry analysis. Activation markers are typically analyzed on days 1 and 2 after activation with the T Cell Activation and Expansion Kit, mouse. However, please feel free to modify checkpoints according to your experimental needs. For each sample, resuspend up to 1×106 nucleated cells in 50 µl activation marker master mix (see activation marker antibody panel in "Things to prepare in advance"). For further flow cytometry analysis, it is recommended to remove the MACSiBead Particles from the cell suspension. Wash empty wells with cold buffer to rinse out the remaining cells on the plate. Wash cells with cold buffer. Resuspend cells in buffer at a density of up to 2×107 cells/ml and vortex thoroughly. Make fresh T cell medium with TexMACS™ medium supplemented with 2-Mercaptoethanol (final concentration 0.01 mM) and 100× penicillin/streptomycin stock solution (final concentration 1% ). See "Staining for analysis of cell proliferation" for more details. ▲ Note: Restimulation of cells is performed in the absence of IL-2. Resuspend cells at a density of 1×107 cells/ml in T cell medium without IL-2. Depending on the total cell number and experimental requirements, transfer either 1 ml cell suspension (1×107 cells) per well to a 24-well plate or 100 µl cell suspension (1×106 cells) per well to a 96-well plate. Make sure to treat samples from which supernatants for the MACSPlex analysis are to be taken only with PMA/ionomycin and not with brefeldin A. Make sure to use T cell medium without IL-2. Add 20 ng/mL PMA and 1µg/mL ionomycin to cells and incubate for 2 hours at 37 °C. Add brefeldin A to a final concentration of 2 µg/mL to the cells and incubate for another 2 hours at 37 °C. Cells are now ready for further analyses. ▲ Note: For the analysis of lineage-specific effector cytokines (see "Flow cytometry analysis of secreted cytokines"), cells can be further processed immediately after the brefeldin A treatment. For the collection of supernatants for MACSPlex analysis, it is recommended to stimulate cells with PMA/ionomycin for up to 24 hours. Analysis with MACSPlex after shorter stimulation times (e.g. 2–4 hours) might still be successful, but result in lower data scores. Make sure to treat samples from which supernatants are to be taken only with PMA/ionomycin and not with brefeldin A. It is recommended to collect supernatants on day 8, 24 hours after restimulation with PMA/ionomycin. Analysis with MACSPlex after shorter stimulation times (e.g., 2–4 hours) might still be successful, but result in lower data scores. Keep supernatants cool after collection (2–8°C) and either process them immediately or freeze at –70 °C for later use. Frozen supernatants can be stored for up to 4 weeks at –70 °C. Handle all blood components and biological material as potentially hazardous. If unknown samples are expected or known to contain levels >2000 pg/mL, it is recommended to dilute the samples to make sure the fluorescence values are within the dynamic range of the standard curve (see step 4). Collect 100 µL of supernatant. Centrifuge cell culture supernatant at 10,000×g for 10 minutes at 4 °C. (Optional) Dilute with cell culture medium or MACSPlex Buffer (see "Cell harvest and intracellular staining of lineage-specific effector cytokines"). Immediately analyze supernatants with MACSPlex (proceed to "Cell harvest and intracellular staining of lineage-specific effector cytokines") or store at –70 °C until use. Reconstitute and dilute MACSPlex Cytokine 10 Standard with MACSPlex Buffer, or use the same media as is used for the dilution of the unknown sample. Always use freshly prepared MACSPlex Cytokine 10 Standard solutions. Do not store or reuse reconstituted or diluted standards. Use polypropylene or polystyrene reagent tubes. Do not use glass vials. The generation of standard curves requires eight samples: seven samples of the MACSPlex Cytokine 10 Standard, and one blank control. These samples are measured as duplicates (see "Flow cytometry analysis of secreted cytokines"). Thaw one vial containing the lyophilized MACSPlex Cytokine 10 Standard. Open the vial and add 200 μL of MACSPlex Buffer or media to the pellet. Mix gently. This is the stock solution (10,000 pg/mL for IL-4, IL-5, IL-17A, IL-23 and 50,000 pg/mL for IL-2, IL-10, IL-12p70, IFN-γ, TNF-α, GM-CSF). Pipette 200 μL of MACSPlex Buffer or media into each tube. Perform a 1:5 dilution by transferring 50 μL from the stock solution to the tube labeled 1:5 and mix thoroughly. Continue making 1:5 serial dilutions by transferring 50 μL from the tube labeled 1:5 to the tube labeled 1:25, etc. (see figure below). Mix each dilution well before performing the next transfer. Keep 200 μL MACSPlex Buffer or media as blank control (0 pg/mL). Serial dilution of the MACSPlex Cytokine 10 Standard. The recommended dilution for the CD154-APC, Anti-TNF-a-FITC, Anti-IFN-g-PE and Anti-IL-2-PE anti-mouse antibodies for cell labeling and subsequent flow cytometry analysis is 1:10 for up to 1×106 cells/50 μL of buffer. For the following staining panels, 2 cell samples are required. Add 250 μL of Inside Fix (Inside Stain Kit). Mix well and incubate for 20 minutes in the dark at room temperature. ▲Note: Fixed cells may be stored in azide containing buffer at 2–8 °C for up to 1 week. (Optional) Stain cell surface antigens that are sensitive to permeabilization with appropriate antibodies according to the manufacturer's recommendations. Then wash cells by adding 1–2 mL of buffer and centrifuge at 300×g for 10 minutes. Aspirate supernatant completely. ▲ Note: For staining with even more antibodies in this step, reduce the volume of Inside Perm accordingly. For efficient permeabilization, the volume of Inside Perm should be at least 30% of the overall staining volume. (Optional) If biotinylated antibody was used, resuspend the cell pellet in 100 μL of Inside Perm, add 10 μL of fluorochrome-conjugated anti-biotin antibody, and continue as described in steps 10 and 11. Resuspend cell pellet in a suitable amount of buffer for analysis by flow cytometry or fluorescence microscopy. Store cells at 2–8 °C in the dark until analysis. Mix well before flow cytometry acquisition. Run the assay at room temperature. Work fast and keep samples protected from light, for example, cover plate or tubes with aluminum foil, especially during incubation steps. Unknown samples should be run in replicates, for example, in duplicates or triplicates and in different dilutions to make sure the fluorescence values are within the dynamic range of the standard curve. The MACSPlex assay can either be performed using the MACSPlex Filter Plate with a vacuum manifold or standard polypropylene or polystyrene 1.5 mL reagent tubes. Please refer to the respective protocol (see below) when proceeding. Setup of the MACSPlex Cytokine 10 assay using a 96-well plate. 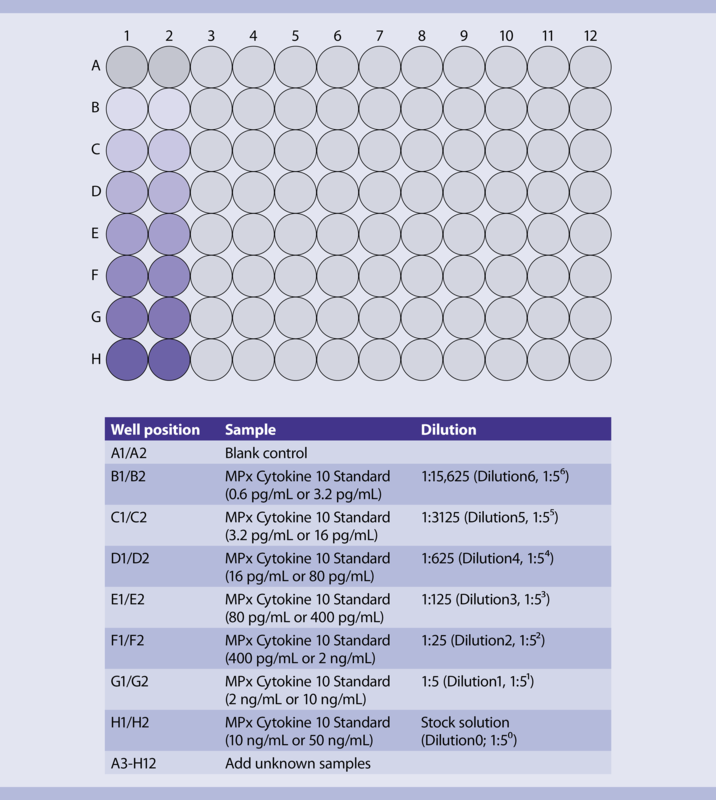 Design your assay using two columns of the MACSPlex Filter Plate for the standards. Add each of the 7 standard samples in duplicates next to each other. Standards should be run in order from the lowest concentration (blank control: 0 pg/mL) to the highest concentration (stock solution: 10,000 pg/mL or 50,000 pg/mL). Start with the unknown sample in the next column of the plate. For details, see figure above. Place the MACSPlex Filter Plate on a non-absorbent surface during loading steps and incubation, i.e., remove any tissues from the surface, to prevent the wells from running dry. Ensure that residual drops under the plate are completely removed to prevent liquid transfer, by placing the plate briefly on a tissue. Cover unused wells of the filter plate for later use with the adhesive foil provided with the kit. Washing steps are described for the use of a vacuum manifold. Alternatively, a centrifuge with an adapter for microtiter plates can be used: Put the MACSPlex Filter Plate on top of a conventional 96-flatbottom microtiter plate without lid and place both into the adapter. Centrifuge at 300×g for 3 minutes at room temperature. Pre-wet required wells of the MACSPlex Filter Plate with 200 μL of MACSPlex Buffer per well and aspirate off using a vacuum manifold designed to accommodate the filter plate (max. –300 mbar) until the wells are drained. Place the filter plate briefly on a tissue to remove any residual liquid. Add 50 μL of MACSPlex Buffer or media as a blank control, 50 μL of each dilution, and the stock solution of the MACSPlex Cytokine 10 Standard to the corresponding wells of the filter plate. Add 50 μL of each unknown sample per well. Resuspend MACSPlex Cytokine 10 Capture Beads by vortexing for at least 30 seconds and transfer 20 μL of MACSPlex Capture Beads to each well. Incubate filter plate for 2 hours protected from light on an orbital shaker (450 rpm). Apply the filter plate to the vacuum manifold and aspirate until wells are drained. Place the filter plate briefly on a tissue to remove any residual liquid. Add 200 μL MACSPlex Buffer to each well and apply the filter plate to the vacuum manifold and aspirate off until wells are drained. Place the filter plate briefly on a tissue to remove residual liquid. Add 80 μL of MACSPlex Buffer to each well. Add 20 μL of MACSPlex Cytokine 10 Detection Reagent to each well. Incubate filter plate for 1 hour protected from light on an orbital shaker (450 rpm). Repeat wash steps 7 and 8. Add 200 μL of MACSPlex Buffer to each well. For sample acquisition using MACSQuant® Instruments and the Express Mode place the filter plate onto the Chill 96 Rack. To prevent liquid transfer from the wells, ensure that residual drops under the plate are completely removed by placing the plate briefly on a tissue. ▲ Note: Perform the flow cytometry acquisition on the same day, as prolonged storage of samples can result in increased background and reduced sensitivity. ▲ Note: Keep samples protected from light by using the protection lid during the flow cytometry acquisition with the MACSQuant Instrument. Use polypropylene or polystyrene reagent tubes. Do not use glass vials. Standards should be run as duplicates. The order starts from the blank control (0 pg/mL) moving to the highest concentration (stock solution 10,000 pg/mL or 50,000 pg/mL). Label reagent tubes for the blank control, each dilution and the stock solution of the MACSPlex Cytokine 10 Standard, and unknown samples. 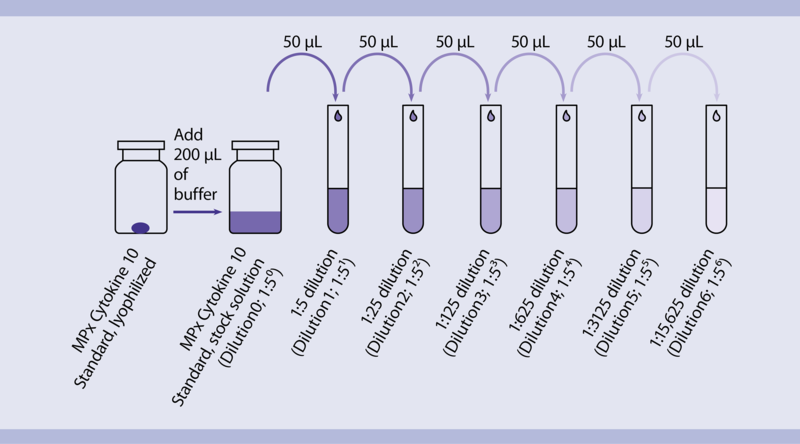 Pipette 50 μL of MACSPlex Buffer or media as blank control, 50 μL of each dilution and the stock solution of the MACSPlex Cytokine 10 Standard into the corresponding reagent tubes. Pipette 50 μL of each unknown sample into the corresponding reagent tube. Resuspend MACSPlex Cytokine 10 Capture Beads by mixing for at least 30 seconds and transfer 20 μL of MACSPlex Cytokine 10 Capture Beads to each tube. Incubate for 2 hours protected from light on an orbital shaker (1400 rpm). Add 0.5 mL of MACSPlex Buffer to each tube. Centrifuge at 3000×g for 5 minutes. Carefully aspirate off the supernatant, leaving 20 μL in the tube. Resuspend the MACSPlex Capture Bead pellet in each tube by adding 0.5 mL of MACSPlex Buffer and pipetting up and down. Resuspend the MACSPlex Capture Bead pellet in each tube with MACSPlex Buffer to a total volume of 80 μL by pipetting up and down, e.g., add 60 μL of MACSPlex Buffer to the remaining 20 μL of supernatant (see step 7). 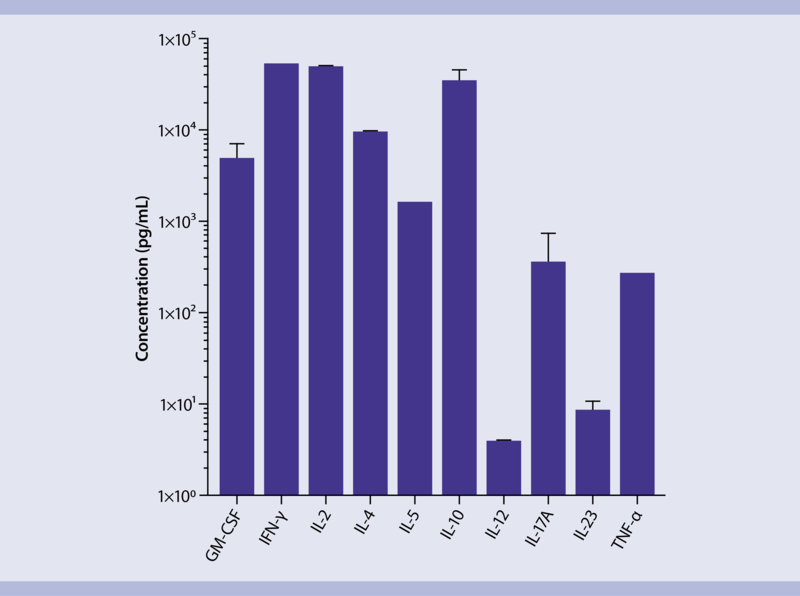 Add 20 μL of MACSPlex Cytokine 10 Detection Reagent to each tube. Incubate for 1 hour protected from light on an orbital shaker at 1400 rpm. Resuspend each pellet in 0.5 mL of MACSPlex Buffer by pipetting up and down. Repeat steps 14 and 15. Resuspend the pellet in each tube with 200 μL of MACSPlex Buffer. For sample acquisition with the MACSQuant Express Mode, transfer samples to a 96-well microtiter plate. Place the microtiter plate onto a Chill 96 Rack and start the measurement. ▲ Note: Acquire cytokine standards first, beginning with the standard samples of the first dilution series in order from the blank control to the highest concentration. Then process the standard samples of the second dilution series in the same order (see also figure "Analysis of cell proliferation"). Afterwards acquire the unknown samples. The kit includes MACSPlex Setup Beads for flow cytometer instrument setup. MACSPlex Setup Beads are not required when using the MACSQuant Analyzer or MACSQuant Analyzer 10 but for all other instruments. The kits is not suitable for use with the MACSQuant VYB. Calibrate the MACSQuant Instrument using MACSQuant Calibration Beads (# 130-093-607). For details, refer to the data sheet of the MACSQuant Calibration Beads. After successfully completing the calibration, the MACSQuant Instrument is ready for measurement. No further steps are required as all necessary setup steps are performed automatically during calibration. The analysis of MACSPlex Cytokine 10 Kit requires a flow cytometer with a blue (e.g. 488 nm) and a red (e.g. 635 nm) laser, which are capable of detecting FITC, PE, and APC. For the purpose of setting up these cytometers, MACSPlex Setup Beads are included in the kit. For instructions on the setup procedures of other flow cytometers, please refer to the Application note General instructions for MACSPlex Cytokine Kits. To perform the acquisition and data analysis of the MACSPlex Cytokine 10 Kit, mouse with the MACSQuant Instrument, it is recommended to use the Express Modes MACSPlex_Standard and MACSPlex_Sample to achieve automated measurement and data analysis. For details, refer to the relevant special protocol under the Library tab of the product page. The minimum version number of the Express Mode package needed to run the assay on the MACSQuant Instrument can be found there as well. To check the version number of the Express Mode package available on your MACSQuant Instrument, please select Help> Info> expressModes within the MACSQuantify Software. The version number of the Express Mode package increases with each Express Mode update. Make sure the MACSQuant Instrument contains an Express Mode package with at least the same or higher version number than the special protocol is marked with. Flow cytometry analysis of phenotypical surface markers of mouse CD4+ T cells. CD4+ T cells were isolated from a single-cell suspension, which was prepared from a BALB/c mouse spleen, using the CD4+ T Cell Isolation Kit, mouse. Cells were fluorescently stained with CD3ε and CD4 antibodies directly after isolation (Day 0) or after 7 days of expansion (Day 7), using the T cell Activation and Expansion Kit, mouse and TexMACS™ Medium. Flow cytometry analysis was performed using the MACSQuant Analyzer 10. Flow cytometry analysis of phenotypical surface markers of mouse CD4+ T cells. CD4+ T cells were isolated from a single-cell suspension, which was prepared from a BALB/c mouse spleen, using the CD4+ T Cell Isolation Kit, mouse. Cells were fluorescently stained with CD3 and CD4 antibodies directly after isolation (Day 0) or after 7 days of expansion (Day 7), using the T cell Activation and Expansion Kit, mouse and TexMACS Medium. Flow cytometry analysis was performed using the MACSQuant Analyzer 10. Analysis of cell proliferation. (A) Cell proliferation was analyzed by counting cells directly after isolation and subsequently on days 1, 3 and 7 after activation/expansion using the T cell Activation and Expansion Kit, mouse and TexMACS Medium. Cell numbers were determined using the MACSQuant Analyzer 10. (B) Visualization of cell proliferation by flow cytometry using CellTrace™ Violet Cell from ThermoFisher. (A) Cell proliferation was analyzed by counting cells directly after isolation and subsequently on days 1, 3 and 7 after activation/expansion using the T cell Activation and Expansion Kit, mouse and TexMACS Medium. Cell numbers were determined using the MACSQuant Analyzer 10. (B) Visualization of cell proliferation by flow cytometry using CellTrace Violet Cell from ThermoFisher. Flow cytometry analysis of activation markers of mouse CD4+ T cells. CD4+ T cells were isolated from a single-cell suspension, which was prepared from a BALB/c mouse spleen, using the CD4+ T Cell Isolation Kit, mouse. Cells were fluorescently stained with CD4 and CD25 antibodies on days 1 and 2 after activation/expansion with the T cell Activation and Expansion Kit, mouse and TexMACS Medium. Flow cytometry analysis was performed using the MACSQuant Analyzer 10. CD4+ T cells were isolated from a single-cell suspension, which was prepared from a BALB/c mouse spleen, using the CD4+ T Cell Isolation Kit, mouse. Cells were fluorescently stained with CD4 and CD25 antibodies on days 1 and 2 after activation/expansion with the T cell Activation and Expansion Kit, mouse and TexMACS Medium. Flow cytometry analysis was performed using the MACSQuant Analyzer 10. Intracellular staining and flow analysis of lineage-specific effector cytokines. Mouse CD4+ T cells were expanded for 7 days using the T cell Activation and Expansion Kit, mouse and TexMACS Medium. Cells were then restimulated by PMA/ionomycin and treated with brefeldin A. Subsequently surface activation marker CD154 as well as the effector cytokines TNF-α, IFN-γ and IL-2 were stained with the according antibodies and analyzed by flow cytometry using the MACSQuant Analyzer 10. Unstimulated Mouse CD4+ T cells served as controls. Mouse CD4+ T cells were expanded for 7 days using the T cell Activation and Expansion Kit, mouse and TexMACS Medium. Cells were then restimulated by PMA/ionomycin and treated with brefeldin A. Subsequently surface activation marker CD154 as well as the effector cytokines TNF-α, IFN-γ and IL-2 were stained with the according antibodies and analyzed by flow cytometry using the MACSQuant Analyzer 10. Unstimulated Mouse CD4+ T cells served as controls. MACSPlex analysis of secreted effector cytokines. Mouse CD4+ T cells were expanded for 7 days using the T cell Activation and Expansion Kit, mouse and TexMACS Medium. Cells were then restimulated by PMA/ionomycin. Cell culture supernatants were collected after 4 hours of restimulation and analyzed via flow cytometry for cytokine secretion using the MACSPlex Cytokine 10 Kit, mouse. Flow cytometry analysis was performed with the MACSQuant Analyzer 10 using the Express mode. MACSPlex analysis of secreted effector cytokines. Mouse CD4+ T cells were expanded for 7 days using the T cell Activation and Expansion Kit, mouse and TexMACS Medium. Cells were then restimulated by PMA/ionomycin. Cell culture supernatants were collected after 4 hours of restimulation and analyzed via flow cytometry for cytokine secretion using the MACSPlex Cytokine 10 Kit, mouse. Flow cytometry analysis was performed with the MACSQuant Analyzer 10 using the Express mode.